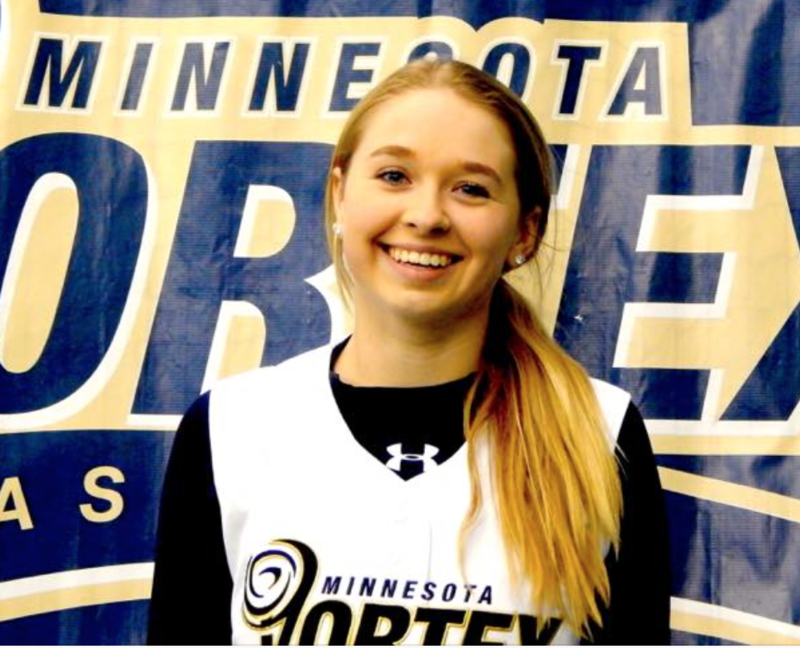 Our friend and teammate, Lexi Kretsch, tragically died on July 10, 2015 as a result of a automobile accident near Mankato, Minnesota. 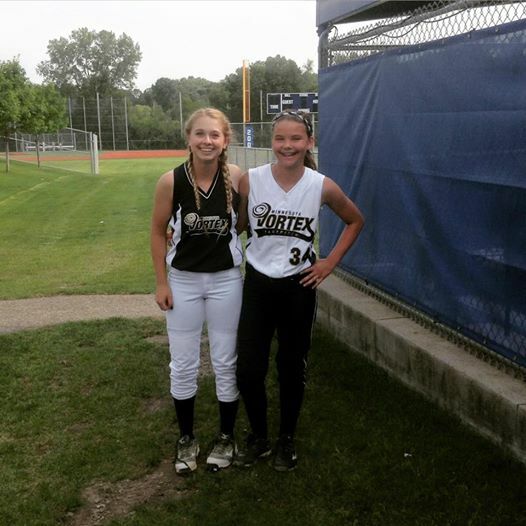 Lexi was an outstanding pitcher on the Minnesota Vortex Elite Softball team and the Waconia H.S. Varsity team. Her loss is devastating and difficult to comprehend. She is a valued member of our organization and she is missed by her coaches, teammates, and our entire organization. The entire extended Minnesota softball community has experienced the loss of not only a teammate but most importantly a friend. In keeping with her kind and generous spirit, Alexis had elected to be an organ donor. Please pray for the success of the transplant surgeries and the recipients. 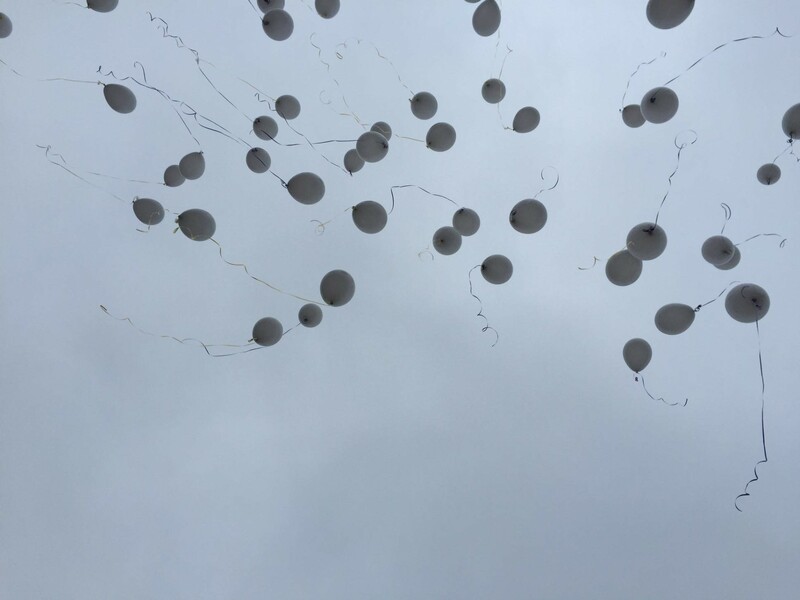 To keep her memory close, plans are being made to construct a memorial of some kind with the new softball fields being constructed west of the new Waconia High School. All funds donated here will be used for those purposes. Thank you for loving Alexis and being a wonderful part of her life. Thank you for the support you will offer to her mom, Jennie Kretsch, and her entire family over the coming days, weeks, and years. Click this link to go to Lexi's GiveForward fund. Click this link for Lexi's Obituary. Click this link for Lexi's Tribute page. There are more pictures and notes here. 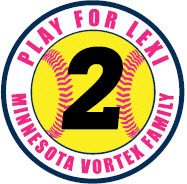 Click these links for the WCCO Channel 4, and KSTP Channel 5 stories on Lexi and her teams. 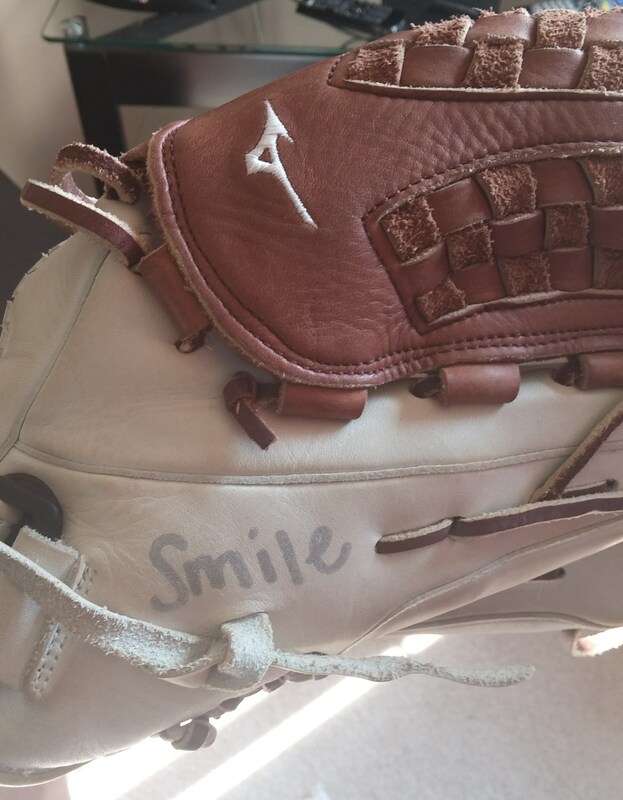 Lexi's glove always reminded her to "Smile"
We are so sorry to hear about Lexi's accident and passing. What a tremendous loss for everyone who knew her. Althugh our PWYSA 12U players didn't personally know her, we were touched by this tragedy. 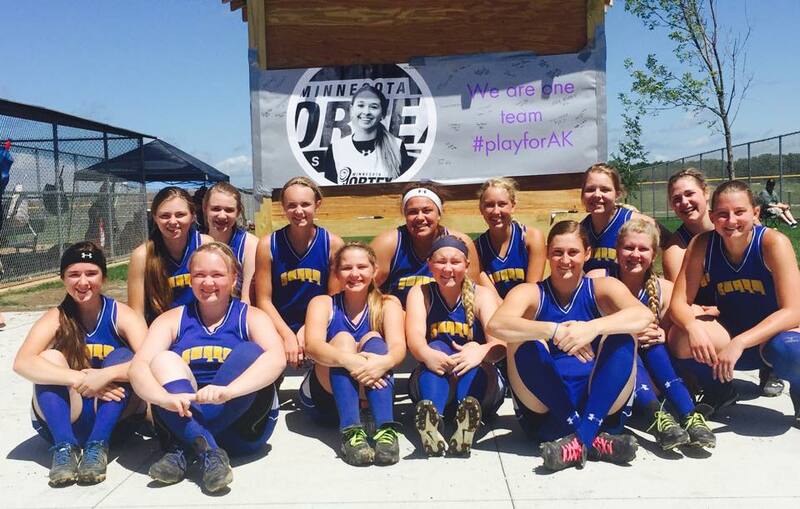 Like many others in the softball community, we chose to wear #2 on our arms during the State Tournament last weekend. I have attached a picture. Take care. Please pass along our sympathy to Lexi's family. The past weekend started out with such a dose of reality on what is truly important. We gathered and prayed for Lexi's family then tried to get focused on softball. I told the team the Vortex are here because that is what Lexi would have wanted so now we need to get focused on ball too. So as the tournament went on we found our selves in the semi final game still in the winners bracket against the Renegades 98. We had the lead but they were coming back and as our pitcher came out to pitch the final inning her face showed she was scared to death to finish this thing. I waited for her in the circle and handed her the ball and said, "Remember what's important. This is just a softball game, so go get em". We went on to win that game and win it all. The Vortex and the Moose are very similar programs in my opinion and in way I think Lexi helped us win State. My heart broke when I heard the news about Lexi. 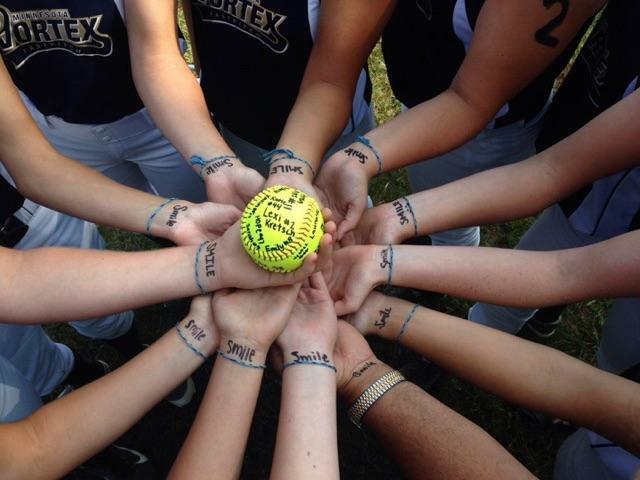 Please know all of us are praying for you and the rest of the Vortex softball family during this difficult time. 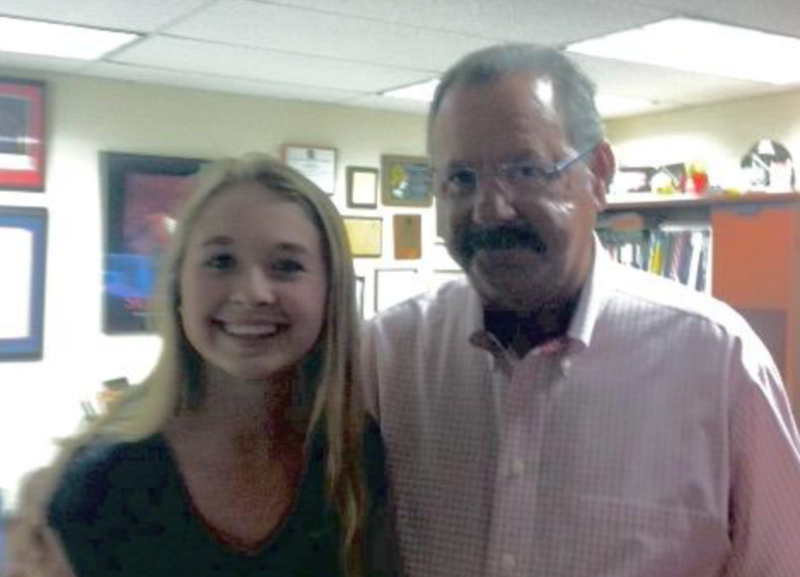 Lexi recently visited with Arizona Wildcats Softball Coach Mike Candrea. I just heard the news regarding Alexis and want you to know that my thoughts and prayers are with you and your family! Such a wonderful young lady and so sad to hear the news of her accident. We send our love and prayers! I just wanted to send a note of thoughts and prayers on the loss of Lexi. My daughter stepped in to pitch against the 16u in last weekends tournament- as Lexi stepped in to pitch against us. As a pitchers mom, you become very observant of opposing pitchers and what I noticed immediately was what an amazing athlete/pitcher she was - but more gratifying as a mom was the smile she had on her face as she shut our team down. The amount of leadership she provided to the team was beyond obvious and the support your team gave her was amazing. There are no words that can describe or empathize with the loss the Vortex and Kretsch family has suffered. Just know that as a softball community, our thoughts and prayers are with you all as you navigate these tough times.